Nutritional Deficiencies. Lories and Lorikeets have very specialized dietary requirements, specifically fruits and nectar, and some formulated lory diets (powders and pellets). Lories are particularly vulnerable to hemochromatosis or iron storage disease. It is very important to ensure that the total dietary iron remains below 100 parts per million (ppm). This can be accomplished by feeding a quality commercial diet supplemented with fruits and vegetables that are low in iron and ascorbic acid. Bad Feather / Beak Condition; Missing and Misshapen Feathers: Beak and Feather Disease (PBFD). A deadly, highly contagious (air-borne disease). Only supportive treatment available. No cure. The Ongoing Health Programme provides your pet bird with all of the vitamins and minerals necessary for top health. Within three weeks of starting the programme you will notice increased shine and feather vitality in your bird. These changes reflect a bird in top health. The effects of Dr. Marshall's products on Sammy Shiels is truly amazing. This is an example of a Lorikeet in perfect health. These products do not contain dye or colour enhancers, instead, the products affect the health and vitality of the bird, making him happy and in perfect condition. Turbobooster produces the glossy shine to Sammy's feathers. Dufoplus brings out the orange and yellow colors. Ioford produces the bright eyes, and the richness and contrasts of the colours. Please note that further information and these products themselves are available in the U.S.: www.ladygouldian.com. Friday Water Cleanser Turbobooster, Dufoplus, Ioford Lorikeets are susceptible to bacterial and yeast contamination from their food and cage. Water Cleanser at water cleanser dose should be used daily to clean their food containers and weekly to clean the cage. This treatment will prevent most bacterial and fungal problems. Fruit juice (apricot, orange or peach) offers the best method to medicate or supplement the diet of Lorikeets. Antibiotic medicines should be added to a teaspoon of your Lorikeet's favorite juice to ensure the correct dosage is received during medication treatment. 1 Water Cleanser is prepared by adding 1gm (level white spoon) into a litre of water. The drinking vessel is filled from this litre and the rest is used to clean the cage and utensils. It cleanses the bowel of harmful food- and water -related germs, promoting a stronger natural health. 2 Turbobooster, Dufoplus and Ioford are added to fruit juice daily for three consecutive days. 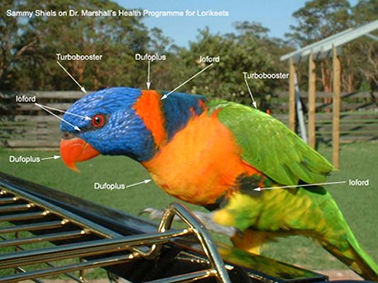 Turbobooster provides protein and essential fatty acids that are a neglected part of Lorikeet nutrition. Dufoplus and Ioford provide the extra vitamin A and trace elements needed for perfect health. Into 4 milliliters of juice using a teaspoon measure, add 6 drops of Turbobooster, 5 drops of Ioford and 5 drops of Dufoplus. Energy supplement should be made available in a finger drawer or small dish fresh daily. This is a potent source of vitamin B used during recovery from illness. It is highly palatable to lorikeets and can be used on a daily basis as part of its routine diet.